After some recent heated activity here on Meta, I've had some time to reflect upon what is important here and what is maybe, splitting hairs and I think that this post is of the latter. It has really put into perspective for me, what is more or less universally offensive. I've since joined in one of the chat rooms to help clear up the close vote review queue and I'm enjoying the community and working with constructive members in ways that suit my activities here. I think this will be a much better way of improving things here, than posting on Meta with over emotional reactions to what I perceive as unfairness to the underdog, so to speak. It's time to focus on the good things in the community and have faith in our strength as a community to rid the community of any real threats to our community, rather than keep monitoring the pulse for any changes. For if I continue to do that, I will only alienate myself from the very community I love. I've left the original question in tack so the answers and comments make sense, except to anonymise the images. There are other questions that deal with similar issues: How to deal with mob voting and there is a focus on the Be Nice policy. This is simply a discussion post to elucidate a mob mentality that is really distasteful and has no place on SO. A new comer asks a question. One person jumps on this question and a stream of upvoted comments and banter ensues with a massive downvote of the question. I have included screen shots below. Now here is linked an upvoted question that covers almost the same issue Downloading/Caching Google Maps for Offline Use. All I want to say is this type of barrage needs to stop. One comment, two maybe, but really how many times do people need to ridicule a newcomer? Can't people ask themselves, is this comment constructive and raising the tone of the site, or is it an opportunity to show case wit and ridicule another.. or whatever lies between on the spectrum. When there is a stream of comments and downvotes upon a question, what is the best way to circumvent what is perceived as mob mentality? 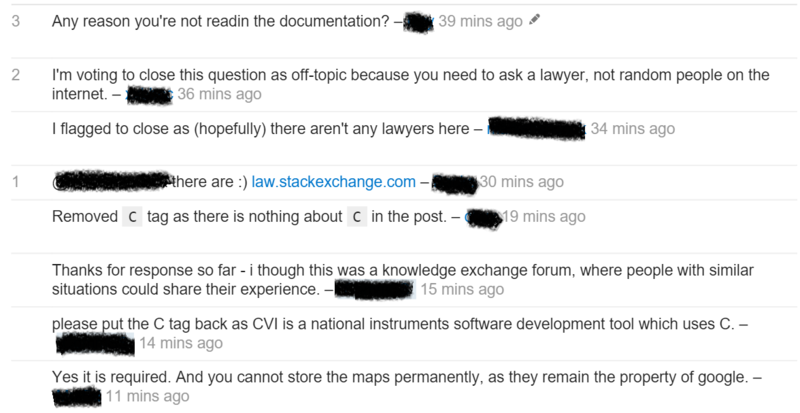 In this case I commented, found an answer and flagged the comment thread. If anyone else has any better ideas, it would be good to hear them. I kind of understand where you were coming from. Even if the comments aren't overtly abusive, there's really no need to be the 5th or 6th person to pile on. Someone has already explained what's wrong with the post, there's no need to carry on here. Things are getting a little out of hand in the comments here, and they may need to be purged. The flagging option often yields positive results. Moderators usually seem to be happy1 to clear the wreckage and handle the post appropriately, and it spares you the time and aggravation of being pulled into the mess. With that said... Please remember to vote to close questions that aren't a good fit for the site, many times the quickest way to stop a feeding frenzy is to put a post out of its misery. This question isn't about a programming problem, but it's a legal question about the usage of an API. The subject of these questions meets none of those bullet points. As such, they are in fact off-topic for SO. They should probably be closed. They're also bound to receive some downvotes. Now, in the linked examples, no-one is being rude. The comments are to the point, leaving out any personal opinions. The only problem (in my opinion), is that you're linking to a post from 2011 as an example why the screencapped question should stay open. Back then, the rules were different. That question is no longer on-topic for SO, and as such, I've voted to close it. Most users I know of at very least skim posts before posting. Implying mob mentality is... Not very nice. b) a question that fits nicely into the sites guidelines. After a prolonged period of seeking to affect positive change or awareness utilizing Meta, I have decided to hang up those cleats. It simply was an ineffective and ill-suited conduit in retrospect. As I have a deep sense of attachment to SO that I wish to maintain, I have changed my focus. I will be concentrating my efforts on helping to keep the Q&A quality as clean as possible with the few resources that I can bring to bear. Primarily through the efforts of the close vote reviewers and related efforts of awareness. We all have a common love for the good that SO embodies. I will do my best at being fair and balanced in maintaining that. Does SO really not care about its users?